Sitting aboard the Stewart Island ferry as the Pacific Ocean smashed at the bow, Doesburg’s latest work began to take shape, her mind lit up by the roiling sea and the old-fashioned excitement of an ocean journey. “Crossing to and from the island on the boat gave me a sense of an inner journey, and of the ebb and flow of life,” says Doesburg, who was born in Dusseldorf, Germany. After emigrating to New Zealand in 1988, Doesburg’s new island home gave her the leap of courage to throw herself into a career as a full-time artist, predominantly capturing weather, cloud-patterns and landscapes (especially around the Dunedin area). With a background in advertising and dress-making and tailoring in Germany, Doesburg decided to retrain, and graduated with a Diploma in Fine Arts from the Dunedin School of Art in 1993. After teaching printmaking at King’s High School for six years, Doesburg switched to lecturing at the Dunedin School of Art, all the while touring the South Island giving workshops, and exhibiting her work in New Zealand and overseas galleries. Although originally specialising in printmaking, Doesburg has now branched out into mixed media and painting, and has a gallery and studio opposite the iconic Dunedin Railway Station. 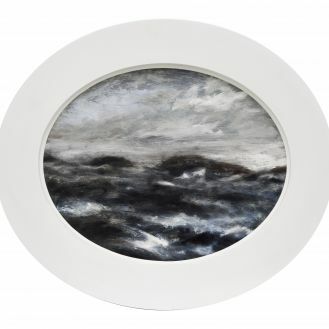 The oval shape framing her latest series, Soliloquy Suite, helps capture the feeling of being onboard a vessel that is being enveloped by the sea, says Doesburg; wild, unpredictable and brimming with vitality. The Stewart Island voyages were reminiscent of her 2006 adventures to the Chatham Islands - a similar sense of wind-swept, rugged isolation endures. 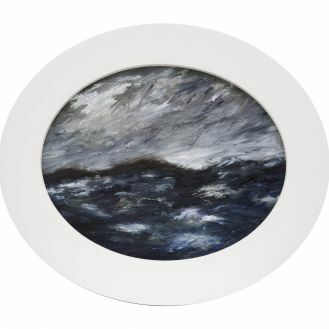 Painted in a dense, cloying palette of grey, black and navy, the series feels like a snapshot from the middle of a violent south island storm - the waves swallowing the ‘eye’ of the artist, who is both apart from and at one with the water. Remote islands remain a lifelong fascination for Doesburg - making New Zealand uniquely suited as her artistic base. “The inclusion of the elegies in my work acknowledges the different or ‘other’ cultural framework through which I view the world...German words in a non-German speaking context visualizes a degree of cultural isolation.” says Doesburg.